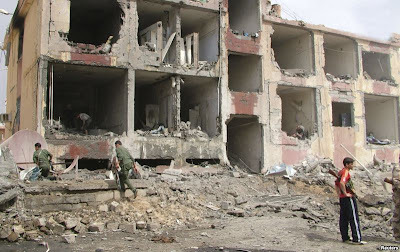 October 20, 2012 - It was, starting at least in 2007, the goal of the US, Saudis, and Israelis to trigger a region wide sectarian war with which to overrun the governments of Lebanon, Syria, and Iran. This was documented in detail in Seymour Hersh's 2007 New Yorker article, "The Redirection" which was covered in depth in, "Syrian War: The Prequel. A recent bombing in Beirut, Lebanon left high ranking security chief Brigadier General Wissam al-Hassan dead. Al-Hassan is described as "anti-Syrian." Before Al-Hassan's death was announced, and literally as bodies were still being pulled from the wreckage caused by the bombing, politicians from Saad Hariri's faction began immediately blaming Syria for the attacks. 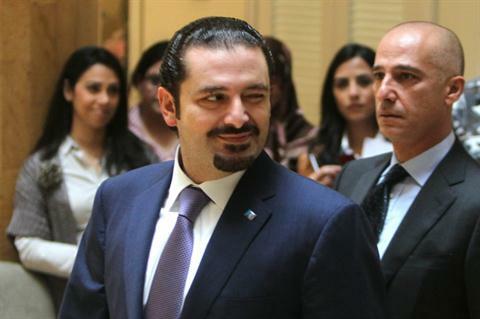 Hariri himself also laid the blame on Syria, offering no other details or supporting evidence. While the Western media claims it is a shocking revelation that Al Qaeda is "amongst" the fighters attempting to overthrow the Syrian government, it is well documented that it was Al Qaeda from the very beginning who began armed operations against Syria, using Lebanon and Turkey as a base of operations, with explicit support from the West. The operations were carried out under the tenuous cover of "pro-democracy" protests and with a constant torrent of disinformation provided by the Western media. Originally posted May 21, 2012 -The United Nations has been inexplicably silent over revelations that the United States, Saudi Arabia, and other Persian Gulf states, are arming militants in Syria in direct violation of a UN brokered ceasefire. Additionally, the US has openly threatened to arm Kurd militants in Syria to "rise up" against the government. While in reality this constitutes a greater threat to neighboring Turkey, and perhaps an attempt to motivate Ankara to take a more aggressive stance against Syria, the threat of purposefully inciting more violence in a conflict that has allegedly claimed "10,000" lives, seems not only grossly irresponsible, but a violation of international peace. 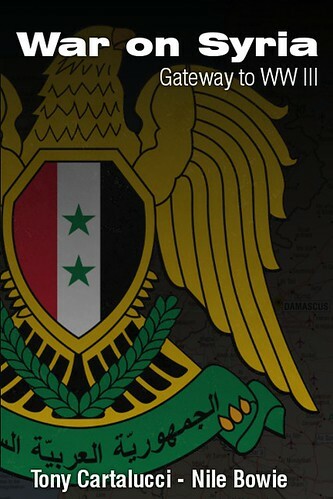 The West's meddling in Syria does not end there. Recently, clashes have broken out in Lebanon, revealing a large base of operations supporting the destabilization in neighboring Syria, located along the Lebanese-Syrian border. The significance of this discovery, and extremist groups in Lebanon being directly involved, highlights the veracity of a 2007 New Yorker article by Seymour Hersh titled, "The Redirection," which exposed a joint US-Israeli-Saudi operation to create a violent extremist front and direct it at Hezbollah in Lebanon, President Bashar al-Assad in Syria, and at the Iranian government. It becomes clear then that Lebanon's recent unrest is a result of a greater gambit targeting not just Syria, but the Hezbollah-Syrian-Iranian sphere of power, following the US-engineered "Arab Spring" installing proxy leaders across the Arab World to specifically support this last leg of geopolitical reordering. Such support has manifested itself as political support from US-proxy president Moncef Marzouki of Tunisia, and similar support from US-installed Libyan Prime Minister Abdurrahim el-Keib, who's nation has also committed not only arms and cash to Syrian terrorists, but fighters as well. Image: Saad Hariri, former prime minister of Lebanon, is admittedly a co-conspirator in US-Israeli-Saudi designs to destabilize with militant extremists and violently overthrow the Syrian government. While Hariri feigns anti-Israeli sentiment and makes public calls for Lebanese to refrain from sectarian violence, he is the primary facilitator of both extremists crossing over into Syria, and their creating of chaos in the streets of Lebanon. A 2010 Fortune 500-funded International Crisis Group report describes in detail Hariri's deep ties, and indeed dependence, on the West. Now, it is reported that "anti-Assad clerics" have been shot by Lebanese soldiers - and just as was seen during the assassination of Rafic Hariri, demagogues are attempting to draw Sunni Muslims into a conflict with Shi'ias. A strategy of tension is being used to divide the Lebanese people into a deadly conflict mirroring the sectarian, not "democracy," driven unrest ravaging Syria. With Saad Hariri, the US, and Saudi Arabia overtly working to undermine Syrian stability, it appears that all of the characters described by Hersh in 2007 are now openly implementing their plans. The purposefully nebulous coverage by the Western media over violence in Lebanon so far, and a disingenuous depiction of it being "spill over" from Syria is meant to portray a general sense of chaos consuming the region. In reality, it is a premeditated destabilization dependent on fostering violence between Sunni and Shi'ia Muslims, just as was purposefully done in Iraq to balk an effective Sunni-Shi'ia alliance that achieved initial success fighting a foreign occupation led by the US starting in 2003. Saad Hariri portends that his alliance with the US, Israel, and the Saudis is simply an attempt to protect "Sunnis" from a "Shi'ia threat." In reality, as empires have done all throughout history, Hariri's invitation to the West to meddle in his own nation's affairs will open the door to the destruction and dismemberment of not only his enemies, but inevitably his own movement as well. A faction too weak to fight its rivals is certainly too weak to fight an invited foreign imperial power that decides to overstay its welcome. A strategy of tension is at play in the Islamic World, the trap set, hatred for Israel and rival ideologies the bait. Time will answer the question, "have the people of the world learned enough collectively to avoid it?"